FILE - A Pakistani police officer stands guard outside the Barri Imam shrine in interior Sindh, Islamabad, Pakistan, Feb. 17, 2017. Religious clerics in Pakistan issued an Islamic decree, or fatwa, Tuesday condemning suicide bombings and other acts of terrorism as un-Islamic and against the teachings of the religion. 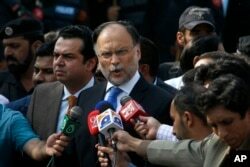 FILE - Pakistani Interior Minister Ahsan Iqbal talks to media in Islamabad, Pakistan, Oct. 2, 2017. FILE - Two men in handcuffs, whom the police said belong to the Tehreek-e-Taliban Pakistan [TTP] group, are shown during a news conference at the Crime Investigation Department after their arrest, in Karachi, January 2013. "This fatwa was much-needed because the previous fatwas were issued in private capacities. Different Islamic sects — either Sunni, Shia, Barelvi, Deobandi or Ahle-hadith — had a consensus on it. So, this is a national narrative and must be appreciated," Ayaz told VOA.